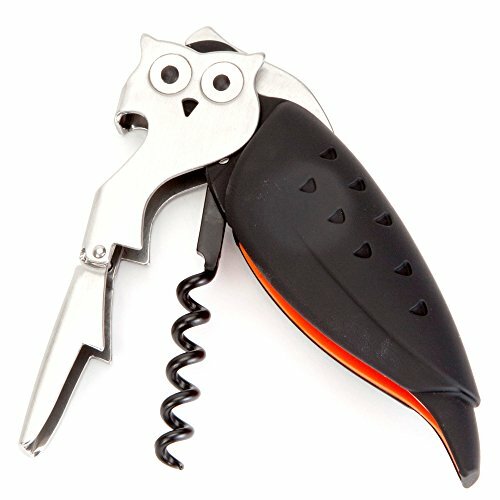 Bits and Pieces - Corkscrew Wine Bottle Opener - Waiter's Owl Novelty Bottle Opener/Corkscrew - Stainless Steel All-in-one Corkscrew Bottle Opener by Bits and Pieces at Verve Wine Bar. MPN: 43673. Hurry! Limited time offer. Offer valid only while supplies last. Opening wine will be a hoot with our novelty corkscrew. Bottle opening is effortless with soft-touch handle, double hinge design and foil cutter. Opening wine will be a hoot with our novelty corkscrew. Bottle opening is effortless with soft-touch handle, double hinge design and foil cutter. Also includes a bottle opener making this your go-to tool for any occasion. Stainless steel construction. Measures 5" x 1 3/8". Opening wine will be a hoot with our novelty corkscrew. Bottle opening is effortless with soft-touch handle, double hinge design and foil cutter. Also includes a bottle opener making this your go-to tool for any occasion. Stainless steel construction. Measures 5" x 1 3/8".